Yotam Ottolenghi is one of my favourite chefs and this is another of his scrumptious recipes. 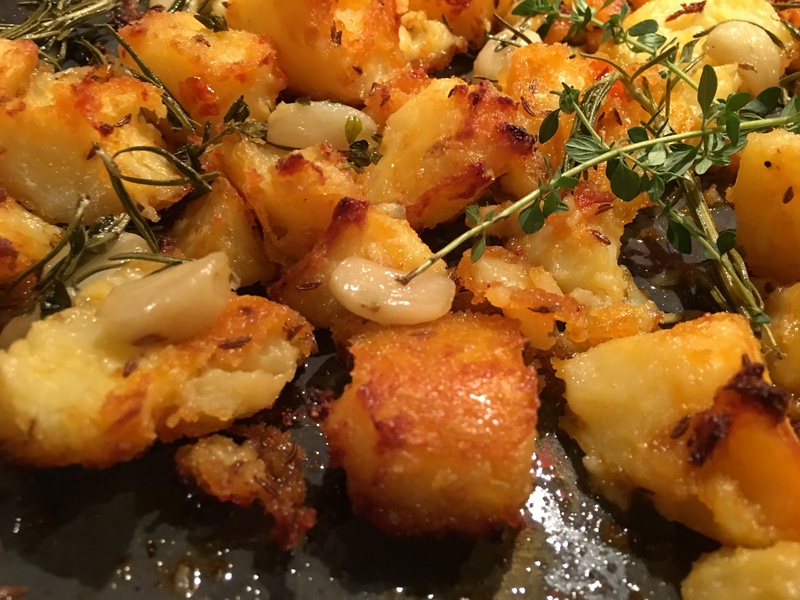 These spicy potatoes roasted in duck fat with confit garlic have an unbelievable crunch, achieved by adding semolina. The best roast potatoes I’ve ever eaten. Use Harissa, Sambal Oelek or any chilli paste you have and adjust the amount, according to how spicy you like things. If preferred, use olive oil instead of duck fat. Don’t be tempted to halve the recipe, they’re too good. Preheat oven to 150°C. Put garlic, duck fat and herbs in a small ovenproof casserole with a lid. Cover and roast for 40 minutes, until garlic is caramelised and soft. Remove from the oven and strain fat into a large heatproof bowl. Put garlic and herbs aside. Increase oven temperature to 200°C Bring a large pot of salted water to the boil, add potatoes and parboil for 10 minutes, until half-cooked. Drain into a colander, shaking the potatoes to fluff up the edges, then leave to dry for 10 minutes. Mix potatoes, semolina, caraway or cumin seeds, harissa and two teaspoons of Maldon salt into the bowl of reserved fat, then spread out on a large oven tray. Roast for 45 minutes, turning once or twice, until golden-brown, then stir in the confit garlic and herbs and roast for 10-15 minutes more, until potatoes are dark golden-brown and crisp. Serve hot, sprinkled with some extra salt. With less than a week to go till Christmas everyone is busy shopping and cooking. A week later we’ll all be at it again for New Year. Here are some links to Café Cat recipes to help you through the holiday season. If you want to make your own Christmas cake or pudding it’s not too late – just give it a good drizzle of brandy a couple of days before serving and it will be nice and moist. And this cheat’s recipe for Quick Individual Christmas puds, made with crumbled shop-bought cake, is a sure winner for end of year gatherings. Sausage rolls and mince pies are traditional Christmas finger foods which can be baked ahead until just slightly under-done, then frozen (or refrigerated for a day or two) and reheated for a few minutes on the day. These sausage rolls decorated to look like Little Piggies are sure to please the smaller guests. At this time of year I always make a Glazed Ham and some Gravlax with Sweet Mustard Sauce because they both slice into a lot of servings which means they last for several meals. 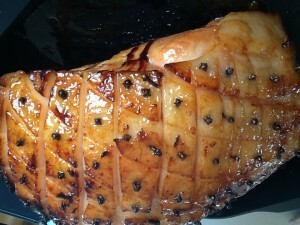 Cook the ham a bit longer than the one shown in the photo, so the glaze goes a darker brown. I must have been in a rush that day! Make double the Sweet Mustard Sauce recipe and keep it in a jar in the fridge. You’ll find it goes well with ham as well as Gravlax or Smoked Salmon. 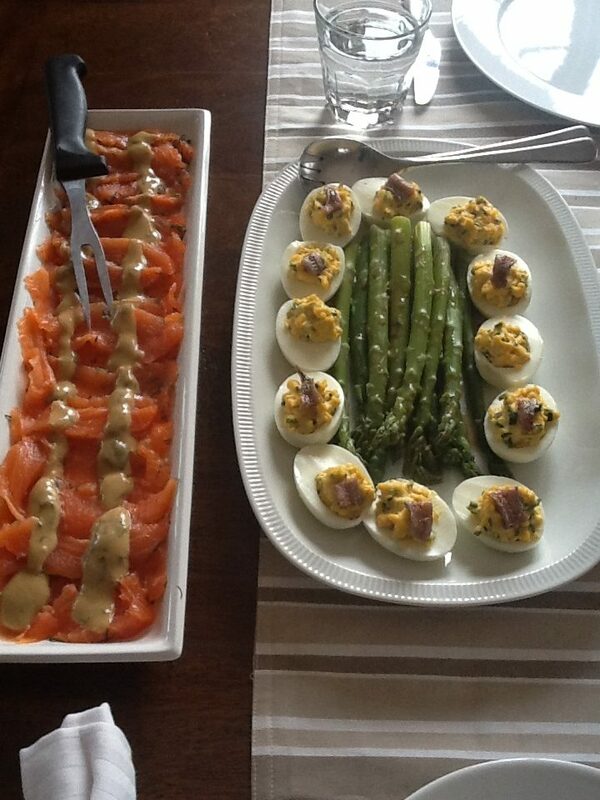 Here you can see a platter of sliced Gravlax next to some cooked asparagus surrounded by good old-fashioned devilled eggs, garnished with a small piece of anchovy. I would like to wish all my readers a very Merry Christmas and a happy, healthy and safe New Year. I look forward to sharing many more recipes with you in 2019. Everyone is busy at this time of year. Despite best intentions it’s easy to run out of time to make puddings, cakes, mince pies and all the other traditional Christmas fare. Adapted from a recipe published some years back in Delicious magazine, these individual Christmas puds, which were called Cheat’s mini Christmas puddings in the magazine, are very quick to make. The original recipe makes four one cup puddings, but I think half that amount is enough. I served them at a ladies Christmas lunch and we concluded that they were so small we could pretend they didn’t have any calories at all! Preheat oven to 180°C. Grease 8 half cup (125ml) dariole moulds or ramekins. Chinese tea cups (see photo below) are ideal. Place cake, milk, eggs, sherry and fruit mince in food processor and pulse a few times just to combine – you want it to remain chunky. Divide among the moulds and place in a large baking dish. They should be almost full to the top. Pour boiling water to come halfway up sides of moulds. Cover baking dish with foil. Bake 45 mins or until firm and slightly risen. Meanwhile make custard. Heat milk, cream, sugar and vanilla to boiling point, but do not allow to boil. Mix egg yolks and cornflour in a bowl. Tip some of the hot milk into the egg yolk mixture and stir to combine, then tip back into saucepan. Continue to cook over low heat, stirring constantly with a wooden spatula, until thickened. Do not allow to boil. Pour custard through a sieve to remove any tiny bits of cooked egg white. When puddings are cooked remove moulds from dish, rest 10 mins, then tip onto individual serving dishes. 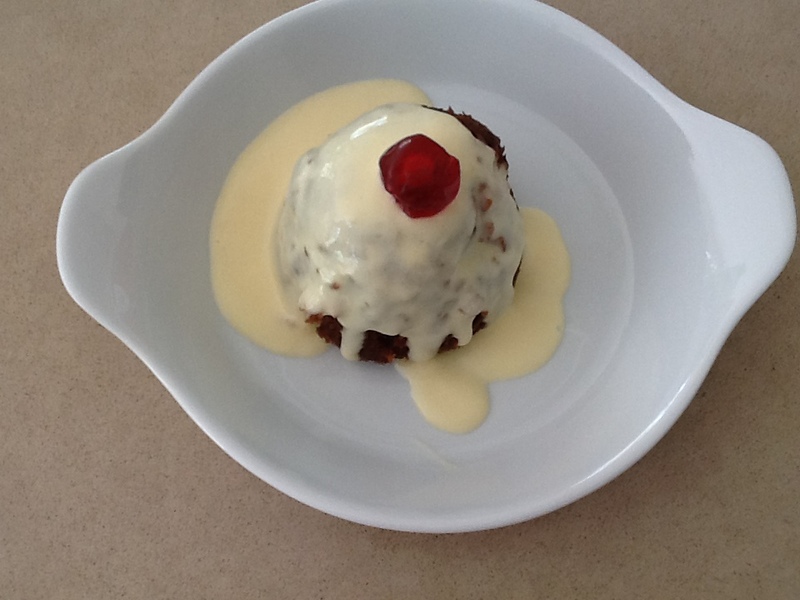 Serve with custard (warm or cold) and decorate with glace cherries. 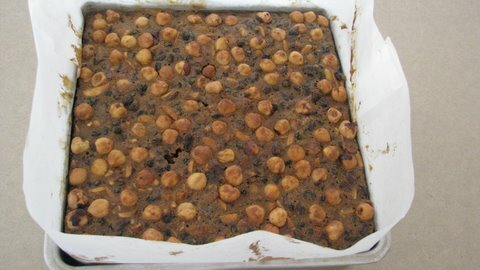 Christmas cakes and puddings are best made in November or even earlier, so they have time to mature. I make them on the same day, so I can weigh out the fruit and nuts into two big bowls, one for each recipe, which saves time. Don’t worry if you don’t get around to it until a few days before Christmas. Anything home-made always tastes so much better than the bought variety. And Christmas cakes and puddings make wonderful gifts, especially for elderly people living on their own. I’ve been making these old family recipes since I was at school. The original versions came from my paternal grandmother, but they’ve evolved over the years with slight modifications. I now use melted butter instead of the traditional suet in the pudding mixture, but you can use suet if you prefer. Covering the cake with marzipan and then white royal icing to look like snow was all part of the tradition. Most of my family don’t like marzipan and we’re all trying to cut down on sugar, so nowadays I cover the top with nuts instead. I’ve also started using the “all in one” method for the cake which uses melted butter. When we made Christmas cakes at school creaming the butter and sugar by hand, with a wooden spoon, seemed to take forever. The teacher whose name was Mrs Wood came round to inspect and decide whether or not it was time to start adding the eggs. No electric mixers back then, so by the time you got the tick of approval you felt as if your arm was about to drop off. The “all in one” method is so much quicker and works well. Feel free to substitute – dried apricots instead of the cherries or mixed peel, walnuts or pecans instead of the almonds, whisky instead of the rum or brandy. Making little changes will allow you to make the recipe your own, to hand down to your grandchildren. Soak fruit and nuts in brandy or rum overnight, or if you’re in a hurry, for at least an hour. Line a 25cm round or square cake tin with a double layer of baking paper. Place the tin on a baking sheet on which you have placed 4 thicknesses of newspaper. Wrap a band of newspaper of the same thickness around the outside of the tin, using a stapler to join the ends. Preheat oven to 150°C. If you have the option to use your oven in conventional mode, without the fan, the results will be better. If you have to use the fan the cake will cook more quickly than without. Place all the ingredients in a very large mixing bowl and mix thoroughly with a large spoon or with your hands, wearing disposable gloves if preferred. When thoroughly mixed, spoon into tin and smooth the top. Cover the surface evenly with whole blanched almonds, hazelnuts or macadamias, pressing them in a bit with your hand. Bake for 3 to 3½ hours on the middle shelf of the oven. Test with a toothpick after 3 hours. If the top gets too brown before the middle is ready, place some foil loosely over the top of the cake to stop the nuts from burning. When it’s ready the top of the cake will have an even colour, feel firm to the touch and a toothpick inserted in the middle will come out clean. Cool thoroughly then store in an airtight tin in a cool, dark place. If liked, halfway through storage time pierce all over the top with a skewer and drizzle with a little extra brandy or rum which will soak in. Keeps for several months in a tin. If you live in a warm humid climate keep it in the fridge. To serve, tie a wide red ribbon around the outside of the cake and decorate the top with some holly leaves and berries – real or plastic! Weigh out all the fruit and nuts into a large bowl. Make the breadcrumbs in the food processor. Use the food processor to grate or finely chop the apples. Cut orange into four, remove any seeds then process till finely chopped and pulpy. Chop figs, almonds and apricots (if using) in the food processor. When cold store in a cool, dark cupboard or in warmer climates, in the fridge. To serve, steam again for 2-3 hours. Tip the pudding out onto a serving dish. Heat some brandy then set it alight and pour over and bring to the table while still burning. (Not easy, it usually goes out!) Serve the pudding with cream or brandy butter. Makes one 2kg or two 1kg puddings. In a small bowl with a wooden spoon, beat butter with the sugar until light and fluffy. Gradually beat in vanilla and brandy. Pile into a small dish and sprinkle with grated nutmeg. Chill well and serve with Christmas pudding or Sago Plum Pudding. After caviar and truffles, lobster is near the top of the list of luxury food items which are expensive, so we don’t eat them very often. I was in Costco recently looking for something special to serve over the holiday period. They had imported American lobster tails for about $45/kg and as a friend had told me they were very good I bought four, which worked out at about $15 each. Peanuts compared with what you pay for lobster in a restaurant. If you’re substituting Australian crayfish tails, which are smaller, you will need four. We ate the first two hot with chive butter, but concluded that the best way to enjoy lobster is cold. 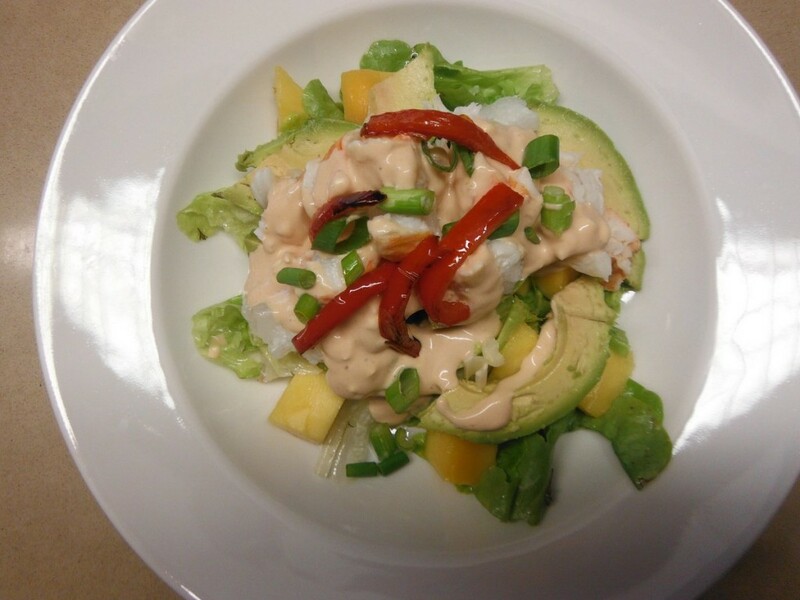 So with the second two lobster tails I created this very simple salad which we ate as a main course. Mangoes are in season at the moment and the result was delicious. Thaw lobster tails if frozen then cook them in boiling salted water for 8-10 mins or until shells are red and flesh is white and opaque. Plunge into iced water and when cool drain, and pat dry with paper towels. Remove shells and slice flesh into medallions. Heat olive oil in a frying pan and add red capsicum slices and a sprinkle of salt. Fry for 10-15 minutes, stirring often, until soft and starting to char on the edges. Cool. For Seafood Dressing, mix all ingredients together. If using large lettuce leaves tear them into smaller pieces. In a bowl mix salad greens with salad dressing and arrange on two serving dishes. Divide mango and avocado between the two plates. Top with the lobster, spoon over some seafood dressing, then garnish with the spring onion and a few pieces of red capsicum. There will be capsicum left over for another use. Sprinkle with coarsely ground black pepper. Notes: instead of using red capsicum, garnish salad with dry pink peppercorns or salmon caviar, available from specialty shops. Instead of lobster use large cooked and peeled prawns or crab meat. 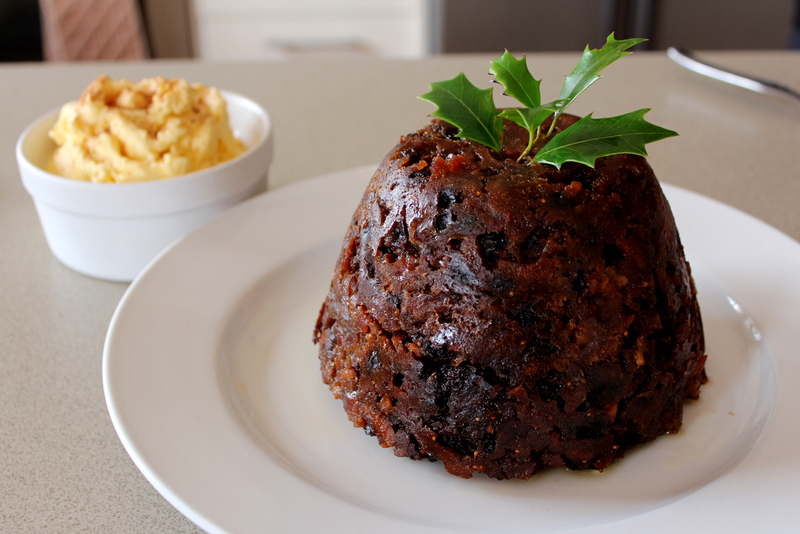 Christmas puddings keep for months and improve with age, so I usually make them in October or November. One for the family and a couple of smaller ones to give to friends. I collect pudding bowls in second hand stores for this purpose. In cooler climates you can store them in the pantry, but in Australia I prefer to keep them in a second fridge we have in the garage. Sometimes I make two large puddings and keep one to serve at a “Christmas in July” dinner party. And if that doesn’t happen the second pudding will still be delicious the following Christmas, more than 12 months after it was made! I decided to adapt my traditional recipe to make it gluten-free. Still perfectly nice for everyone, but suitable for a growing percentage of the population who don’t tolerate gluten. A food processor makes quick work of the breadcrumbs, grated apple, chopped figs and pureed orange. Some people don’t like mixed peel and glacé cherries, so I have included substitutions for these. The number of puddings you end up with from this recipe depends on the size of the bowls – two big ones, or one big one and two small ones, or four small ones. This year I doubled this recipe and ended up with 8 puddings of various sizes as you can see in the photo. Place all the ingredients in a very large bowl and mix well. 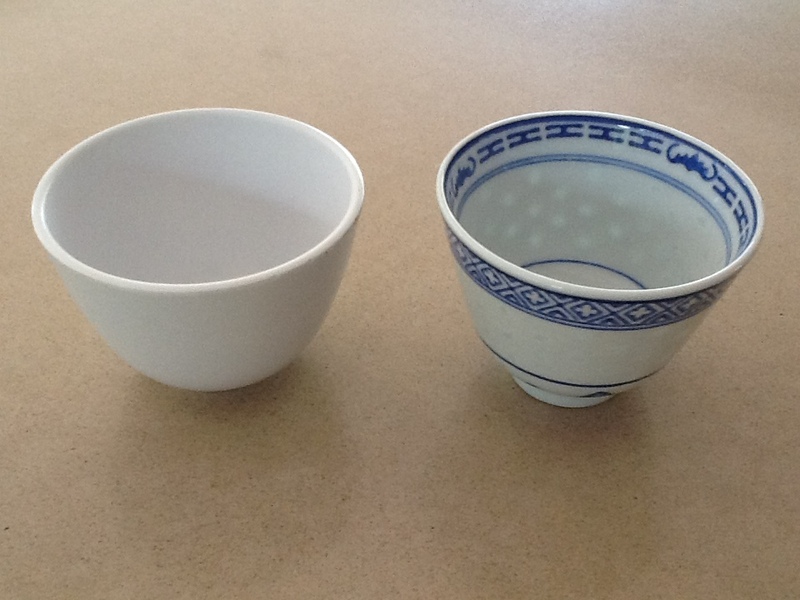 Choose 2 to 4 pudding bowls, depending on size, grease lightly then fill with pudding mixture. They don’t rise much so bowls can be filled almost to the top. Cover puddings with buttered baking paper, butter side down, and tie down with string. Steam puddings (see below) for about 5 hours or until evenly browned. Cool then cover with a fresh piece of baking paper or wrap in foil and store in the fridge. Steaming the puddings: If you have a very large stock-making saucepan you can steam two puddings at the same time, one on top of the other. Place a metal trivet or an upturned saucer in the bottom of the pan, then the first pudding, then an upturned side plate and then the second pudding. Pour hot water in to come halfway up the bottom pudding. Hopefully everything fits and you can put the lid on. If not use two pans, or make half the recipe and just one pudding. Turn on the heat and let the water simmer for 5 hours, topping up from time to time as necessary. The other way to steam puddings is in the oven. Choose a deep roasting pan into which the puddings all fit. Pre-heat oven to 150°C. Place bowls in roasting pan. Pour in enough hot water to come halfway up the bowls. Cover the entire roasting pan with foil and crimp it under to seal. You may need two pieces if it’s not very wide. Place in the oven for 5 hours. Check after 2 hours and top up the water as necessary. To serve, steam puddings again for 2-3 hours and serve with Brandy Butter. 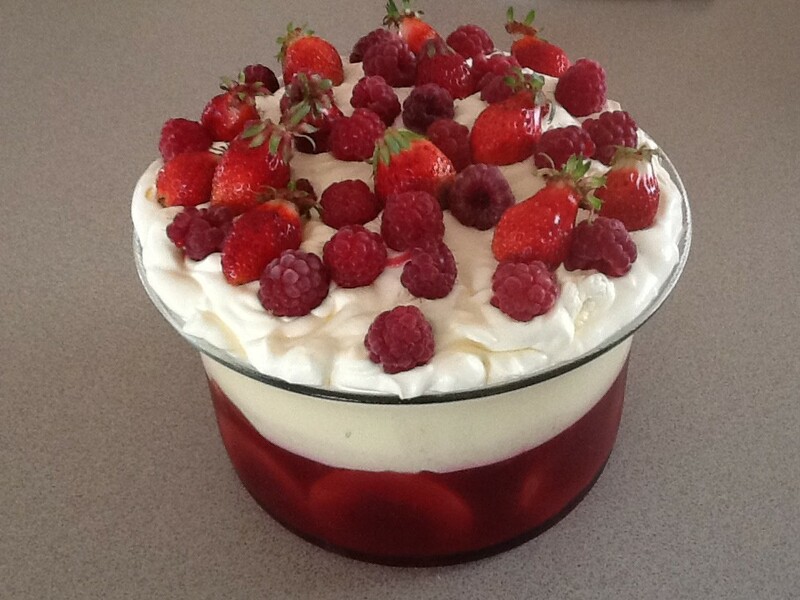 I was looking for a dessert to serve on New Year’s Eve that could be made ahead, didn’t involve turning on the oven, used seasonal fruit, could be transported from Canberra to Sydney with ease and didn’t include raw eggs, making it suitable for a pregnant lady. This recipe which meets all the criteria appeared in a recent advertisement for Kraft Philadelphia cream cheese.The only change I made was to increase the lemon rind from one teaspoon to one tablespoonful. Mangoes are at their cheapest in Australia at this time of year. Choose ones which are not over-ripe as they’re easier to slice thinly and curve for the decoration. I made the cheesecake the day before and took it to Sydney in an Esky (Australian name for a cold box, for those who don’t know) on New Year’s Eve. All I had to do was arrange the mango slices on top and it was ready to serve. The original recipe didn’t include passionfruit, but we ate the leftovers on New Year’s day with some pulp spooned over. It was a definite plus, enhancing the flavour of the mango and providing colour contrast. Place mango purée in a saucepan with glucose syrup. Cook, stirring over a medium heat for 15 minutes or until thickened and reduced by half. Set aside to cool. Combine biscuits and butter and press evenly over the base of a 20-22 cm springform pan. In food processor or by hand beat cream cheese, sugar and lemon rind until smooth. Mix in gelatine mixture and melted chocolate, then fold in the whipped cream. Pour filling over biscuit base. Spoon over mango mixture and swirl through the white mixture using the tip of a knife, smoothing the top. 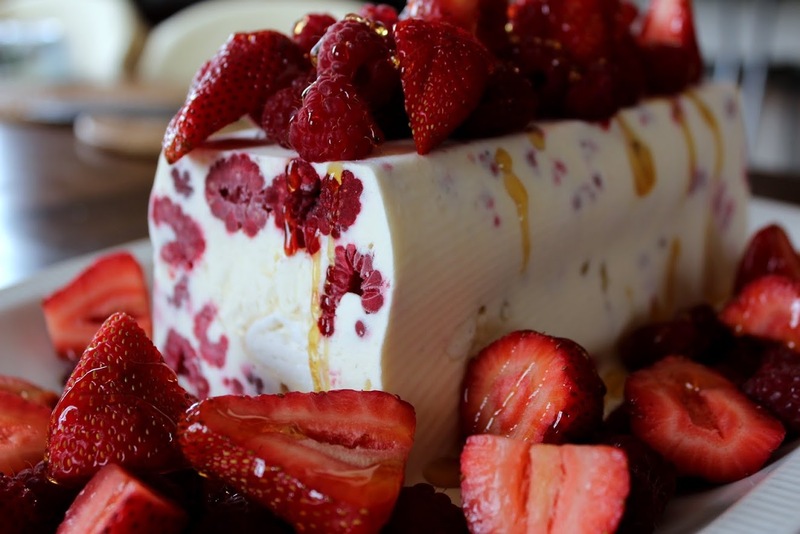 Refrigerate 3 hours or overnight. Serve decorated with fresh mango slices and, if liked, some passionfruit pulp. Serve thick pouring cream separately. Variations: use peaches, apricots or strawberries instead of the mangoes – pulp in the filling and sliced fruit to decorate. 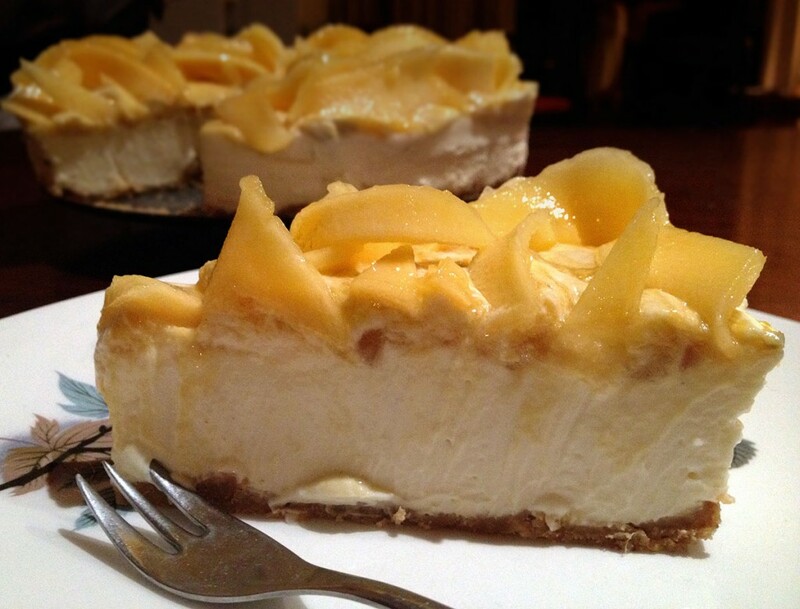 For a Ginger Mango Cheesecake use ginger nut biscuits for the crust and mix 2-3 Tbs finely chopped crystallised ginger into the filling. Note: if preferred, omit the white chocolate and use one and a half cups of cream, whipped. When whipped the cream will more than double in volume. Candied or glacée fruit has been made for centuries as a means of preserving fruit through the winter months. During a recent wander around the Adelaide Central Market I came across some Candied Vanilla Pears, which inspired me to have a go at making my own. They were a rich dark brown colour and delicious. They almost looked as if they were made of chocolate. After reading through half a dozen recipes online, I found one which uses a slow cooker. This appealed to me as you can go away and leave the fruit to cook for hours without looking at it. It’s a time-consuming activity and you only end up with a few pieces, but having successfully done one batch I think I’ll do some more. The criss-cross pattern you can see in the photo is from the wire rack! For those who have never been, the Adelaide Central Market is fabulous. Around 80 under cover stalls selling fresh fruit and vegetables, as well as fish, meat, bread, cheeses and other gourmet delicacies. It’s open every day except Sundays and public holidays. I wish we had something similar in Canberra. Halve pears lengthwise. No need to peel and you can leave the stem on one half. Use a metal skewer to pierce fruit all over. Place in slow cooker and add enough water to barely cover. Remove pears and measure the water – mine was a litre or four 250ml cups. In a medium saucepan, heat the water with one and a half times the amount of sugar – so for me that was six cups – stirring to dissolve the sugar. Put pears back in slow cooker with enough syrup to cover, keeping the rest as spare in case you need to top up. Add vanilla pod and seeds, cover, turn the heat setting to high and cook for 6 hours. The recipe said to turn the pot down to low setting, but it also said the liquid should be gently bubbling. In my slow cooker that meant using the high setting. Keep an eye on it and if they seem to be cooking at more than a bare simmer, turn the heat down to low. If you cook the pears too quickly they will break up. After six hours turn off the heat and leave to cool overnight. Next day turn to high and repeat the process, letting it gently simmer with the lid on for six hours. Next day do the same again, so that’s three times in total. I found I didn’t need to add more liquid but if you do, use the reserved syrup to top up. Next day add the glucose syrup, turn the slow cooker to high and when it starts to bubble cook for about 3 hours, adding more syrup if pears are not covered. Remove fruit from syrup while it’s still warm and place on a wire rack to drain. Keep the rich dark brown syrup to serve drizzled over pancakes or waffles. It will keep for months in a sealed bottle. When fruit has stopped dripping preheat oven to 100ºC. Place the rack over a baking tray and place in the oven for an hour or two. When the surface of the fruit no longer feels very moist to the touch they are ready. Don’t overdo it or the pears will be a bit chewy. Leave the pears as they are for a shiny look, or roll each piece in granulated sugar for a frosted look. Fruit will keep for several months in a tightly sealed container. Serve with cheese – they go especially well with brie and cheddar and look great on a cheese board. Note: if preferred, cut pears into quarters instead of halves. Matthew and I met in Geneva in the 70s when I was working for the British Mission to the UN and he was working for the Aussies. We were each there for 3 years and did lots of skiing and eating, but we didn’t meet until he was just about to leave. Somehow we worked things out and here we are decades later! In Switzerland baked ham is served in many restaurants, invariably accompanied by gratin de pommes de terre dauphinois – or spuds dauphin style in English! Indeed, there’s one place we used to frequent in Geneva which serves nothing else. Ham and potatoes baked with cream, cheese and garlic go so well together – it’s a marriage made in heaven. A chest freezer in the garage allows me to take advantage of special offers and freeze excess produce from the garden, such as tomatoes and cumquats. Early in the New Year our local supermarket was selling off legs of smoked ham with a good discount, so I bought one and stuck it in the freezer. We had friends coming to Woodlands for lunch and as we’ve all had time to get over the festive season I decided it was time to get the ham out of the freezer. There are lots of different recipes for glazes and below are three of my favourites. Basically anything sweet and sticky will do. The gratin recipe is one I picked up on a card in a supermarket while living in Geneva, so it’s very authentic. Gruyère is the traditional cheese for this dish. Other hard cheeses such as Emmenthal or Cheddar will work but the flavour will be different. Forgot to take a photo, so you’ll just have to use your imagination! Heat all ingredients for glaze in a saucepan, stirring until dissolved. If chunky, push through a sieve, then cool. Remove rind from ham by running your thumb around edge just under skin, loosening and pulling as you go. When you have pulled it to within 15 cm of the shank end, take a sharp pointed knife and cut through rind around shank end in a zigzag pattern, then pull off the rest of the skin up to this edge. Make parallel cuts through fat at 2-3 cm intervals, just through the surface, not deeply, first one way and then the other to achieve a diamond effect. If liked stick cloves into each diamond space. Place ham in a large baking dish. Brush with chosen glaze and bake at 180°C for about 45 minutes, brushing with more glaze every 10 minutes or so. It’s ready when it’s an even amber colour all over. Serve hot or cold. Store the ham on a large plate or chopping board in the fridge. Place the plate inside a cotton ham bag or substitute an old pillowcase. Every time you use the ham rinse the bag in cold water and wring it out tightly. This will help to keep the ham fresh and moist for up to 4 weeks. Preheat oven to 180°C. Peel potatoes and slice thinly. Place in overlapping rows in a greased shallow, oven-proof dish, seasoning as you go with salt, pepper and half the garlic. Mix milk, cream, the rest of the garlic and nutmeg and pour over. Cover with foil and bake for 50 minutes or until potatoes are tender – test with a knife. Turn oven up to 220°C and remove foil. Sprinkle with the grated cheese, dot with butter, cut into small pieces and bake for 20 mins or until golden brown. When I’m looking for inspiration I browse through old cook books. I have quite a few, including some by Robert Carrier. Born in the USA in 1923, Carrier’s success came in England, where he worked for most of his life as a chef, restaurateur and food writer. The Jamie Oliver of the 70s and 80s, Carrier tried to persuade the British public there was more to life than meat and three veg. He retired to France where he died in 2006. Carrier said he acquired the recipe for Mezzorgiorno (which I have shortened to “Italian”) Mince Pies served with Panna Cotta and Berry Compote from The Don Camillo restaurant in Provence. It may seem like a complicated recipe, but most of the work is done by the food processor and you can spread it over three days. Make the pastry and filling for the pies on day one. 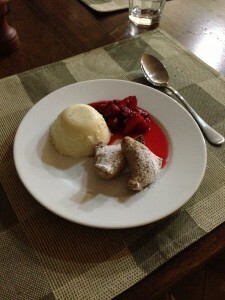 Next day make the panna cottas, the compote and the pies. Refrigerate them covered, but uncooked. On the third day brush with egg and bake an hour or so before serving. The pastry is not easy to roll out and you may find yourself using quite a bit of flour to stop it from sticking, especially on a hot day. Unfortunately too much flour makes pastry tough, so if you’re having difficulty try rolling it out between two sheets of baking paper. You could always substitute home-made or bought shortcrust or puff pastry. Mr Carrier said to cut the pastry into 8cm squares, but I found this made the pies too big – 6 to 7cm is a better size. The original filling included brown sugar in addition to the honey, but the mixture is sweet enough with all that dried fruit and chocolate, so I left it out. Panna cotta – which means cooked cream – is delicious served with just the compote. And the pies are nice served on their own as a change to traditional mince pies at Christmas. But all put together they make an unusual dessert. Pastry: Place sugar, butter, cinnamon and lemon rind in food processor and process until creamed. Add eggs and when mixed add flour. Process until dough comes together in a ball. Tip out, form into a flat disc, wrap in plastic wrap and refrigerate for 2 hours or up to 3 days. Can be frozen for several weeks. Filling: Break chocolate into squares, then pulse in food processor until coarsely chopped. Tip into a bowl. 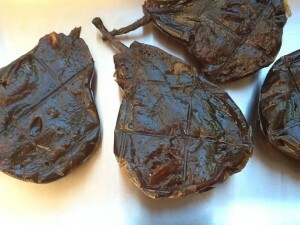 Place dates, figs, honey and Marsala or port in food processor and pulse until coarsely chopped. Add to the bowl with remaining ingredients except egg and icing sugar and mix well. Store in a covered container in the fridge. Keeps several weeks. Assembly: Preheat oven to 170°C. Roll pastry thinly on floured surface and cut into 6 or 7cm squares. You should have enough to make 35-40, but it’s best to make only as many as you can eat on the same day. Also it’s easier to work with about a quarter of the dough at a time. Place one rounded teaspoon of filling on one side of each square, brush 2 sides with egg and fold over to form a triangle enclosing the filling, pinching well to seal. Place pies in the cups of lightly oiled muffin trays, which is what gives them their interesting curved shape. If you don’t have muffin trays use flat baking trays. Brush with egg and bake for 15 minutes or until golden brown. Don’t overcook or they will be dry. Dust with icing sugar and serve warm. Pies are best eaten the day they are made, still warm from the oven, so it’s best to make just the right amount and store leftover pastry and filling for another time. While leftover cooked pies can be reheated next day, they are not as nice as on day one. Place water in a small bowl, sprinkle gelatine on top then zap in microwave to dissolve. Heat cream, milk, vanilla and sugar in a saucepan to boiling point, stirring to dissolve sugar. Add gelatine, mix well, cool a bit then divide among 10 half cup moulds. Refrigerate, covered, overnight. To serve, tip briefly in hot water, run a thin knife around the edge and tip out. Serve with Berry Compote and one or two Italian Mince Pies. Slice or halve strawberries. Place all ingredients in a bowl and allow to macerate for several hours or overnight, stirring from time to time.